Perfect home for your lake vacation for the whole family! Looking for a home-away-from-home for your vacation? The Cairns Home provides this cozy atmosphere you crave and a convenient location on Smith Mountain Lake! On the entry level of the Cairns Home, the spacious kitchen opens to a family dining area. The whole family has a space to gather in the large living area. Also on the entry level is the master bedroom complete with king bed and second bedroom with three twin beds. The Lower level has a third bedroom and second bathroom with a laundry area as well as another family room. The covered porch boast spectacular views overlooking the lake. 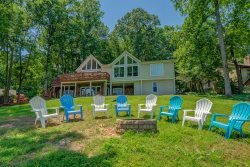 For your further outdoor enjoyment, this home offers a gorgeous lakeside sitting area near the dock, a gentle slope to water, and a sandy swimming area. Contact us today to reserve the Cairns Home to start your Smith Mountain Lake Family Vacation memories!! We truly enjoyed our stay at the Cairns home July 7-14-2018. The home was well maintained and you can tell it has been filled with love. A great walkway down to the dock that the kids enjoyed playing off of the whole week. There was also a fantastic area with stairs that you could walk straight into the sandy bottom of the lake. We cooked out and prepared lots of family meals and enjoyed them all on the beautiful porches! Thank you so much for allowing us to stay in your home and make memories together. Smith family. I had a wonderful 65th birthday here on the lake. You have a wonderful cozy home. I look forward to coming back. Lovely peaceful home here on the lake. My daughter and grandchildren had a relaxing time but busy as well with activities on the lake. Thanks sooo much for the rest and relaxation I very much needed. Thank you for providing a wonderful home and setting for our family to enjoy. We had a great time on and around the lake. Thank you for the wonderful weekend spent at your lake house. We enjoyed every minute! Hope to be back soon! We loved the house and the lake. Lots of fun had by all! Thank you for sharing your wonderful home with us! We had an awesome vacation and made some great memories. Thank you so much for letting our family share your home. We have rented many times here but this was the first time we got a "home" not just a house. Your home is beautiful and we really had a wonderful time. Im also hoping to come back here in the future. Thank you and God Bless! Thank you for making our first trip to Smith Mountain Lake wonderful! We had a great week staying in your home. The water was beautiful this week! All the kids had a great time tubing and playing in the kayaks. Thanks. Wonderful get-away. We had a lot of fun making memories as best friends. Thank you.